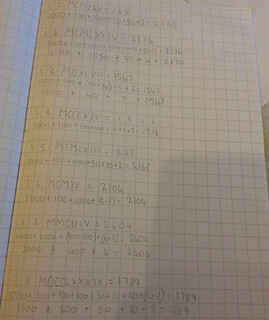 Grace had some maths homework to do this weekend, converting a bunch of roman numerals into normal numbers. Being an interfering sort of parent, I got her to show me what she’d done when she finished. I could see that she’d gotten a lot of them wrong. She had missed the subtraction you’re supposed to do when a large value follows a smaller value. I’m a big fan of rubber duck problem solving, but she hadn’t spotted that she’d gone wrong. I decided to try something similar.